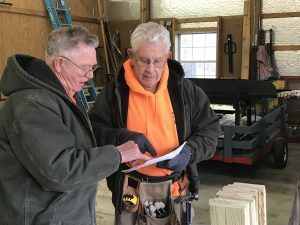 Hidden away in the Gilbertsville community, at the home of organizer Dave Berndt, a group of volunteers are working to make a difference in the lives of those who desperately need it. Gathered together in a workshop, these men are building ramps for individuals in wheelchairs to more easily access their homes. The group that began in 2008, runs solely on donations from groups and individuals in addition to a $3,000 grant they have received from the Marshall County Fiscal Court for the past two years. Once they are notified of a need, mostly from home health care nurses, the ramps are built in sections at the workshop and are then assembled at their destination. All ramps are built to meet OSHA standards and the group is very particular about the specifications and quality of the ramps they produce. Anyone who request a ramp is eligible to receive one, “payment has nothing to do with it” Berndt explained. After the ramp is built and installed, the group will inform the recipient of the cost of the materials it took to build it. If they are able to reimburse all or a portion of the expense, it is greatly appreciated but not required. 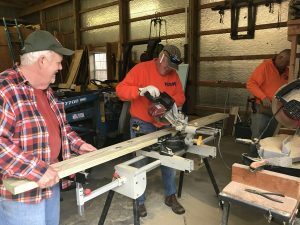 The average cost to build a ramp is between $500- $600 for the materials, the volunteers donate all of their time for labor. Recycling ramps is another aspect of making the ministry work. When a ramp is no longer needed, for whatever reason, the men will disassemble the the ramp and repurpose it in a new location that is in need. 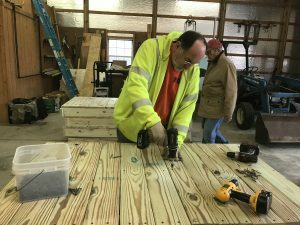 Volunteers, Clay Webb and David Green, have now put together a presentation to assist other counties in forming their own ramp ministry modeled after the successful format being used in Marshall County. They have recently been working with Trigg County in their newly founded ramp ministry and hope to begin working with Mayfield in the near future. While the ministry originally began to serve citizens of Marshall County, the need has presented itself in surrounding counties as well. These volunteers now average a total of 50 ramps per year. With the growing demand, they are now in need of more volunteers, especially “youngsters” as they jokingly explained the youngest member of the group is 67 years old. Many of the volunteers attend Mt. Carmel United Methodist Church but there is no religious requirement to be involved with the group.